Coming soon! Keep an eye out for our updated student handbooks. Tennis has a rich history that today’s players have become very much a part of. From the French Monks playing handball over a rope in the 1000s to Serena Williams becoming the all-time women’s singles Grand Slam winner in the Open Era, TGA has you covered. Learning about or even witnessing historical moments in tennis can go along way in building a students love for the game. However, there are some important moments in time that can help students understand how we got to the great game we play today. For example, did you know that in the 1500s King Henry VII encouraged the building of courts and racquets around England? Or that the first tennis court didn’t appear in the United States until 1874? Women also weren’t invited to Wimbledon until 1884. 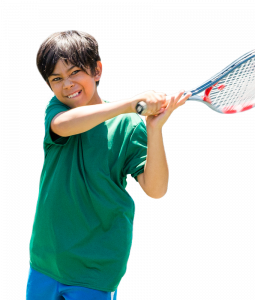 Our coaches make sure the academic portion stays fun, while also being informative because we understand kids mostly just want to hit a tennis ball with their friends. That’s why team trivia can be a great way to incorporate a little history into the young minds of future tennis players. This style of learning can also be encouraging for kids since positive peer feedback will always bring a smile a to anyone’s face. We encourage parents to discuss with their kids what they’re learning in class and the use of the student handbooks can be very helpful. Who knows… maybe some of our current TGA students will be the ones setting new records in tennis history soon. Learn more about other tennis history at a TGA program near you.